This is a fantastic story of two people struggling to come to terms with their new feelings for each other while fearing they will lose the close friendship they have always had. Dakota and Cole have known each other for ever, Dakota has been in love with Cole for almost as long. She's finally ready to admit nothing will ever happen between them and start dating. This sends Cole into a tailspin of emotions. Thing is Colby has secrets. Secrets he needs to deal with in order to move on with Dakota. Will he lose Day for good when she finds out what kind of man he really is??? A heartwarming story I think everyone will enjoy. I highly recommend it. I like Charlene's books I like to read about cowboys. She does a good job of joining her story line and characters. Cole has a ranch and Day is his top wrangler. She loves the horses, especially when she just finished go along a new filly! Day loved Cole since she was 10. He wants to be her best friend. She keeps working on it. She breaks him down and then here comes a big Major Spoiler!. She is crushed and he can't tell her about it. She ignored him, then worked around him. Cole and his crew are worried as she hasn't come to work. Another Major Spoiler pops up and Cole finally understands how Day feels. This was almost a heart breaker the whole story. It was hard to put down or walk away. You really should read this book. Grab some tissues. This is a quick read. Don't let this story get away! Enjoy your reading! I volunteered to read and review this book. Friends to lovers stories have become a staple in the romance genre. 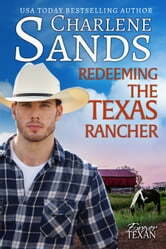 With Redeeming The Texas Rancher, Ms. Sands puts her spin on a commonplace theme and creates gold. Cole and Day are sweet together, clueless to each others feelings but magically light up the story with that instantaneous chemistry they exude. For the good of the heart and the happiness of the soul Charlene Sands creates something to be proud of with this lovelorn duo. Not to be missed. Redeeming the Texas Rancher is the third book in the Forever Texan series. Two hearts, one soul connecting. But Colby isn't willing to risk hurting Dakota. Dakota has been pining after Colby for years while Colby has remained a gentleman to her. But once Colby sees more than the tomboy, he realizes there could be something between them. Do they have a chance? I really enjoyed this story. A definite must-read!